Ghost tourism has been quite rampant and famous today and for most travel backpackers who seek unusual and thrilling activities and Indonesia is such a superstitious country making it one of the best places to go to for these travellers; stories of the past, myths, and folklore combined and Indonesia is basically unbeatable, from graveyards by the yard to ghost shipwrecks, haunted houses are just meh in Indonesia. 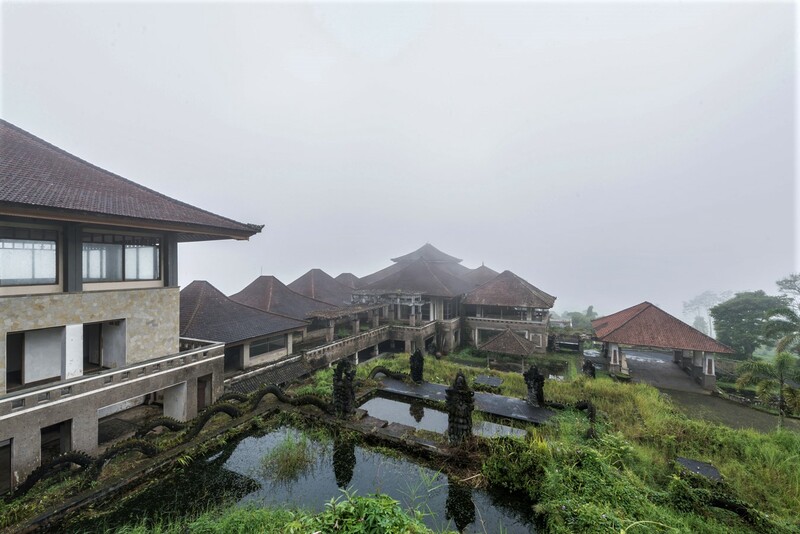 The Bedugul Taman Hotel, or popularly known as the Ghost Palace Hotel was erected back in the 1990s and there is quite the number of stories as to why the hotel earned its namesake. The hotel definitely looks majestic, or it should have been one but today it is on top of a hill overlooking a lake, with all the fog clouding and hiding the supposedly great view, it could only add to the suspiciously haunting explanation why the hotel never saw daylight. 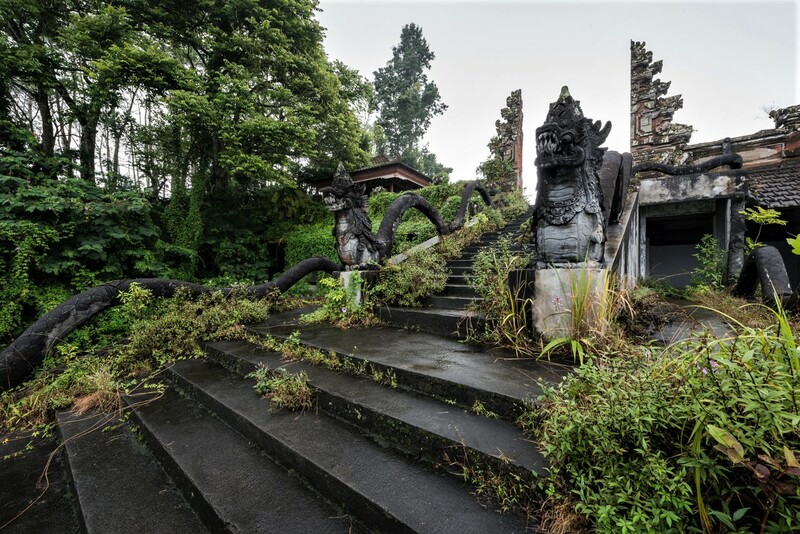 It is as if the Indonesian nature spirits really never forgave the people who bothered their peaceful territory, that is technically owned by Tommy Suharto, the son of the former Indonesian dictator General Suharto who was convicted and sent to prison in 2000 for murdering a judge. This was one belief explaining why the locals call this hotel cursed because Suharto was a corrupt and unjust person. 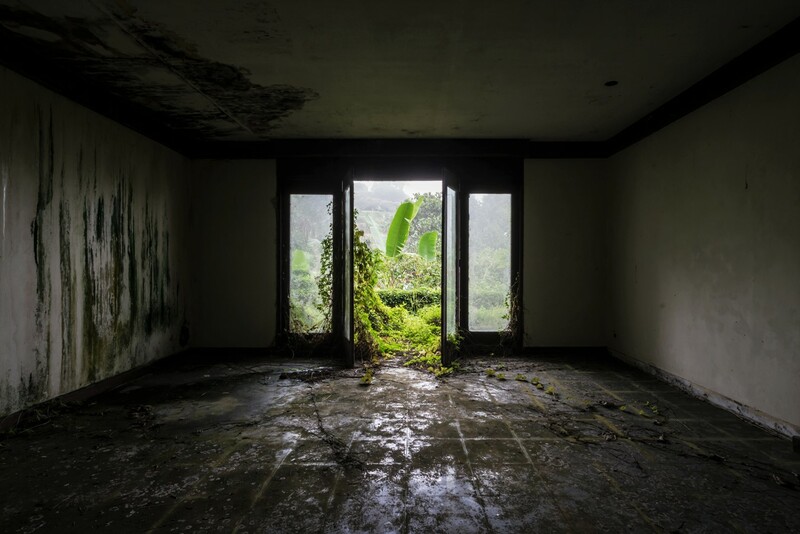 The second theory says that the hotel did welcome guests and everyone just vanished the next morning, no sign of any life in the place, not the guests, or the hotel crew, nothing but their souls said to be lingering in the labyrinth-like corridors of Ghost Palace Hotel. 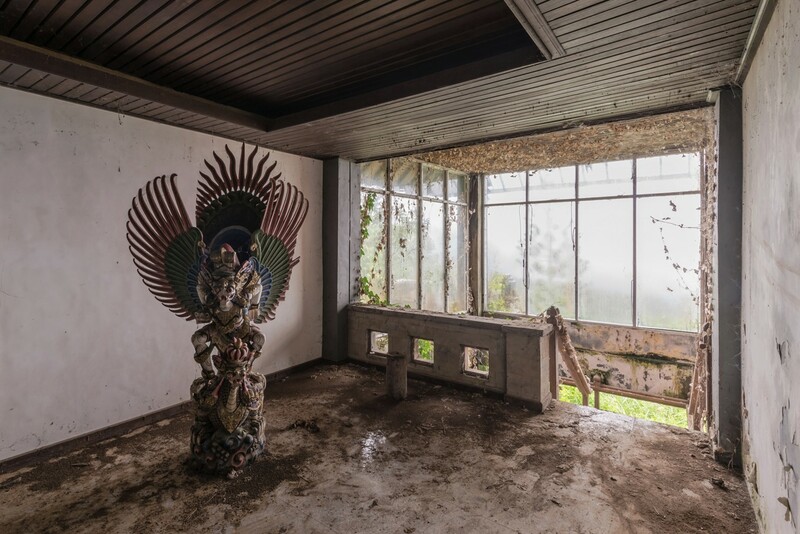 Lastly, and the most ghoulish and morbid yet, is that story where the workers building the palace hotel ended up to be human sacrifices to appease the nature goddesses but it backfired when those betrayed souls were the ones who began haunting the place. Whichever you pick to believe in, there are no certainty or documentation that says which is which, we could only cling to logic and sense, meanwhile, locals are just careful to avoid the place, even taxi drivers that take brave heart tourists up this hill cannot wait to drive away, and the guards on duty are most likely getting paid high digits of money to wave off any unnatural feeling on the back of their necks, if the heavy fog is not too much then perhaps the vibe would do the job to scare anyone away and attract other beings closer. Any reasons why this place is a good spot for ghost tourism and photography are an understatement, the palace is huge and the architecture is of an eerie beauty. The serpents by the grounds seem to know something that people do not, and everything else just fit into a horror movie or documentary. Who would want a serpent that big to welcome anybody? 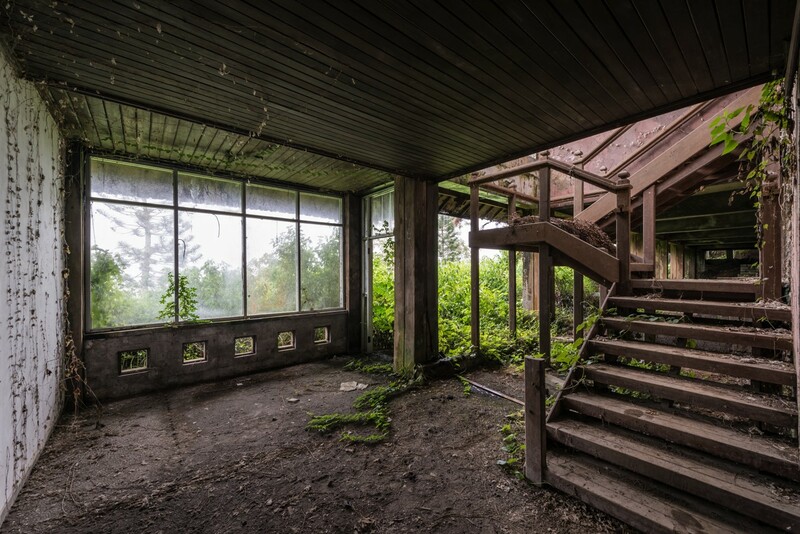 No one would be able to relax in this hotel even if it is not abandoned. But perhaps it is not really meant for relaxation, but for something more, an art that is rarely understood by many but few. Ghost Palace Hotel would give you a different kind of adrenaline that would make you feel alive amongst the opposite. 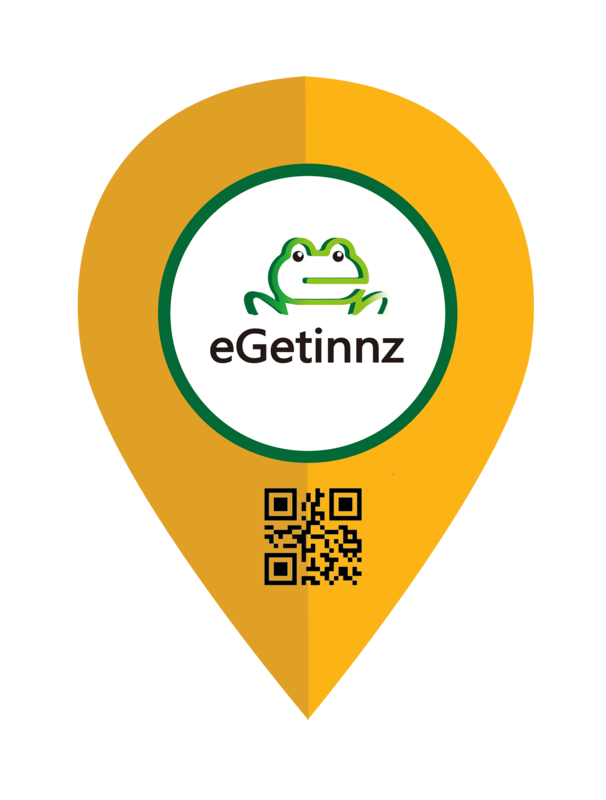 If you would dare to experience it, although Ghost Palace Hotel is not listed with us, eGetinnz offers flexible options for you to choose from and might you be traveling for business, pleasure, or even an unnatural adventure like this.